The Mesh subsystem is used in Fieldpine products to ensure data is available everywhere it is needed and works regardless of network changes and reliability. The following information is provided to aid support workers and is not necessarily a 100% accurate description of internal operation. Consider the simple configuration shown. If possible, sends the information directly to the other store. If enabled, also sends to cloud storage or NAS devices. With a mesh system, any authorised node that gets any form of connectivity, can be updated. Naturally there are a lot of security and control systems as well. SQL databases are possible at any point (only two are shown for illustration purposes), and mesh will maintain those databases with current details. Changes made in SQL can be reflected back to the system and replicated to other databases. For mesh operation, there are a number of concepts to understand. You do not need these as a normal user, only if you wish to understand how the system works. The RmSystem defines the overall owner and database in use. The systems in the picture above would all be part of the same RmSystem. Consider RmSystem to be like "live database" or "test database". If a machine accidentally receives data for a different RmsSystem, it is simply ignored. If you have multiple seperate businesses, each will have a unique RmSystem. If you create a test database, it will be allocated a RmSystem value. RmSystem values are designed to be visible, they are like an IP address or domain name. The primarily identify who this data belongs too. An RmSystem value is four numbers, such as 77,123,89,201192. They are written with commas between individual numbers. In order for a machine to be part of an RmSystem (database) it needs a key. This is a very long random sequence used for encryption control. In order to successfully communicate, a machine needs the RmSystem and a valid key. Business Transactions are stored in TUBT packets. A generated primary key for every mesh record. This key is unique over all systems and uniquely identifies a single record. Physkeys are very like GUID or UUID values but their internal structure is slightly more optimised for indexing purposes, they are not simply random numbers. Physkeys are typically 32 ascii characters, but have excellent compression. Each database in the network, such as SQL/Server or Access is given a unique "Database-Id". These identifiers are allocated automatically internally and may change from time to time. They are designed to be unique to each database instance. In the illustration, databases "1" and "2" would have different database-ids even though they are part of the same RmSystem. Database ids are commonly referred to as dbid. Processes Business Transactions and updates strutures and database tables if needed. An implementor essentially does the work of a transaction. An implementor a piece of code or a program. Each computer also internally generates a unique "device-id" that uniquely identifies this computer. This is generated as much as possible from something that changes rarely, such as network MAC address. On virtualised servers where even MAC addresses may not be stable, the system may allocate random UID values and store them in a file for reference. The intent of this value is to uniquely identify each machine running in the Mesh network. The value of this number is treated as a unique sequence of characters and different systems (Windows/Android etc) can use different techniques. If the device ID changes, extra network traffic is generated. At any single point in time a whole computer will only have one device-id. A internal "key" that is generated when a new RmSystem is created. These values are sometimes used when communicating to external servers as proof that they really are members of an RmSystem they claim to be. Using the install id for this verification means that the main encryption keys do not need to be placed on internet servers. The Install id can be manually changed if required, but some disruption to external servers may occur during change over. The mesh database is fully able to handle duplicate packet transmission. A node can send exactly the same packet of data as often as it wishes and receivers are responsible for blocking data they have already processed. The index NNNN is a unique number designed to aid replication even if the date is changed unexpectedly. The naming scheme has some ability to handle dates being set to the wrong value, when looking at files directly, the date component is what the system claimed the time was, not necessarily the actual calendar date. If the system is enabled for using Fieldpine Online (setting TUBT.SendRm=1) then these files contain the transactions that are to be delivered to Fieldpine Servers. These files should be self cleaning, but if you have a large backlog and are certain that replication to Fieldpine is working, they can be removed. Main storage log file. These files hold all the transactions for a given table. They hold all the data required for a given table. Details of how mesh transactions are generated and processed by different clients. This information is background additional knowledge for support staff. Systems wishing to change data generate Business Transactions and submit these to an implementor. The implementor understands the individual business transaction and processes it by validating and storing to local mesh data files and SQL databases. It also sends it to the mesh layer for routing to other nodes in the mesh network. The mesh layer will take care of all packet transmission and routing, queuing data under network failure conditions. Implementors are assigned authorisation levels, and higher level implementors may reverse or block a local nodes decision. This is rare, but illustrates that nodes do not have the authorisation to make any change they wish. 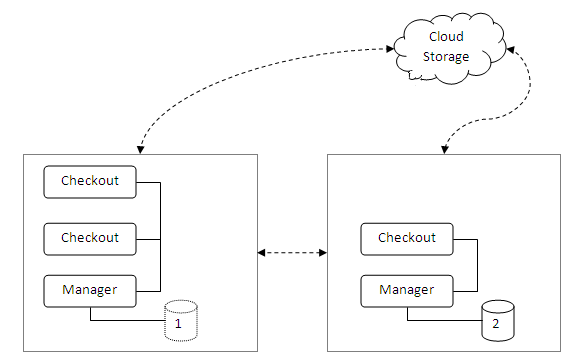 Direct changes to local SQL databases outside the retail system may not be reflected or used. 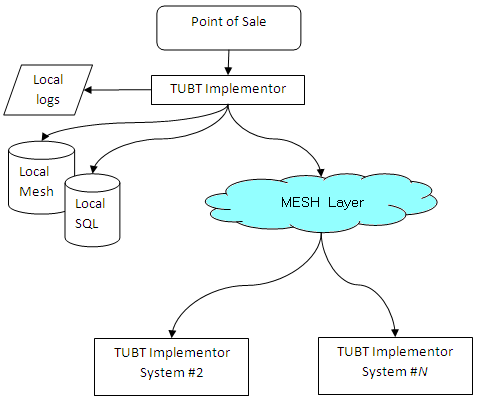 The SQL databases are primarily output copies of the internal mesh database in use. There are exceptions to this to cater for circumstances where directly changing SQL databases is required for operational reasons. Applications must go through the Implementor for each business transaction. No application can directly change key structures. The implementor is responsible for transactional integrity. Mesh databases are self configuring and do not need columns or tables to be added. This means applications can access fields or information (via the APIs) that aren't stored in the database. The implementor will store information into the SQL database when a matching table/column exists. If needed, the packet is written to local mesh data files. Not all packets are kept locally, only those the Pos determines it needs. If any of the settings TUBT.FileAll TUBT.FileUp TUBT.FileDown TUBT.FileAcross are defined, the packet is placed in each matching file depending on transaction type. This may mean the packet is stored several times. Data packets sent via mesh use a variety of techniques to try achieve maximum application reliability in the face of constant change from firewalls, virus detection and other external controls. Passes the message to the link level for transmission. » First 4 bytes contains "GNAP"
If configured with specific IP addresses, the system will use normal TCP and UDP connections to talk directly to these systems. On these links, data is optionally encrypted and sent over the socket connection. Data is always encrypted if crossing from private IP ranges to public IP ranges, or by site setup. On local LAN segments, systems may choose to use multicast to endpoints which terminate automatically at routers. The multicast addresses are in the local administrative range. The address 239.192.6.83 is used as a discovery address used to locate other cooperating systems. The discovery protocol allows computers to find others without needing to be manually configured with IP address. This address is shared between all Fieldpine systems, but is designed to work across systems that should not be joined, such as live and test. Each environment (such as "live" or "test") will choose a multicast address in the 239.192.6.x range as well. This is the multicast address that environment uses. Normal UDP packets are also sent to direct host addresses, especially for background work. Logging of health and status information for example will often use a UDP packet rather than opening a full TCP link. If you do not enable UDP at your network perimeter, the systems will fall back to TCP or other alternatives. If the data contains highly sensitive data, such as passwords, is encrypted with One Time Pad (no key reuse). Each payload is encrypted. Only some encryption techniques are pemitted. A header is created containing sender#, message# and urgency indicators. Optional variable length Encyption control is added. The final packet is sent over the Internet, to either rendevous servers, routing assist servers or direct to the retailers other stores. They need the encryption details to decrypt the payload packets. Data may also be transferred from one site to another via disk storage. This is used as a fallback when network links are completely unavailable, or also for high volume/low priority information that retailers do not wish to pay bandwidth charges for. The most common form of this is USB thumb drives, which the system will automatically read and write when detected. Packets are defined using 4 bytes in the header. The list may change without warning and you should not block by packet type in order to ensure future reliability. Can someone, do something for me? Customers and ISPs sometimes use filtering techniques for various purposes. The traffic generated by a retail system is being sent to another part of the retailers environment and should be considered deliverable. The data transmitted is all application level, between a single customer systems, or sometimes to vendors, partners or cloud servers. Data is not transmitted to random individuals and there is no mass sharing of data. This means that most data will be within a single ISP, as retailers tend to use the same ISP at all sites. Cross ISP traffic is possible and should not be blocked. All links use variable length packets containing data. Different transmission methods (direct IP connection, multicast) will include more or less headers on each packet. The payload data is encrypted, except where explicitly required not to be, such as the discovery protocol. Sites can alter encryption techniques if they wish. Payload data may also be fragmented over several network packets. The application sends different types of information, some is marked urgent, typically those where a customer or staff member is actively waiting for a response. Others are background information of lower priority. Urgent markers are only used in the application for truely urgent data, it is not used as a priority scheme. There is no simple way for external tools to implement Data Loss Prevention (DLP) as payloads are encrypted and exposing the contents would be a security risk. Packets are typically only sent to the retailers own systems.